Faith has a bad reputation, and it is our fault. By “our” I mean those of us who confess that Jesus is the Christ, the Son of God. In a terrible twist of irony, people of faith have turned faith into a dirty five-letter word. Not all of us have done this, of course, but enough of us to attract the attention of the wider world. “Faith,” according to Merriam-Webster’s Collegiate Dictionary, is a “firm belief in something for which there is no proof.” At least this travesty appears several notches down from the primary definition. The same cannot be said for Webster’s New World Dictionary, which gives the following definition top billing: “unquestioning belief, specif. in God, a religion, etc.” Keep in mind that most dictionaries list the most common meaning first. This is why we don’t want preachers using their dictionaries to define important Bible words. Ah, and now we get to the heart of the matter. It is easy to find simplistic or unfair characterizations of Søren Kierkegaard’s writings. His “leap of faith” is often portrayed as a momentous force of will to believe in God and the central claims of Christianity. This makes the Christian faith look bad in every possible way. How can anyone just decide to believe anything? And how could anyone hold such profound, life-changing beliefs in the absence of evidence or, even worse, in the face of overwhelming evidence to the contrary? It doesn’t help that Kierkegaard is notoriously hard to read, even in the best English translations. It doesn’t help that he never used this precise phrase, “leap of faith,” or its Danish equivalent. And it doesn’t help that he wrote some of his most important works (mostly in the 1840s) under a pseudonym, which leaves us wondering whether they represent Kierkegaard’s “official” view. And so, standing on the precipice, it is possible to find oneself “infinitely interested” in God. All of sudden, as Ferreira puts it, one can “dare to be radically changed,… to take a real risk, to put oneself out over seventy thousand fathoms.” In this very moment we leave behind the objectively uncertain proofs of Christianity and embrace the subjectively passionate striving after God. 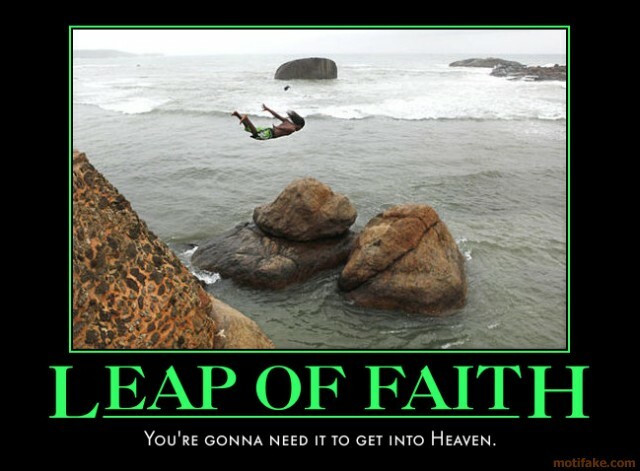 This is more a leap to faith than a leap of faith. But so what? Whether we take the cruder version of the leap or the more nuanced version, Kierkegaard is working with a number of faulty assumptions. For a start, while Kierkegaard makes room for reason and evidence, he doesn’t make room enough. He is overly impressed, it seems, by attacks on the proof of Christianity coming from people like Hume, and attacks on the historical Jesus coming from people like Strauss. But if we think that reason and evidence are on our side (they are), and if we think that Biblical faith is richer than Kierkegaard imagined (it is), then there is no need to separate the certain from the uncertain, the subjective from the objective, and make a leap from one to the other. And in what sense is faith an instantaneous transition? This is where we need to distinguish between the subjective and the objective. From God’s objective standpoint, either we are born again or we are not (John 3:3-6). Either our sins were buried in baptism, or they were not (Romans 6:1-11). At no moment prior to this point are we somewhat saved or mostly forgiven. This is conversion to the faith of Christianity; the transformation that follows within that faith is something else again (Romans 12:2). The subjective experience of faith varies from individual to individual. Belief, which is the beginning of faith (Romans 10:14-17), might come suddenly, as it did to the Emmaus-bound disciples (Luke 24:31). Or it might come reluctantly and with a demand for more evidence, as it did for Thomas (John 20:24-29). Speaking of evidence, some of our arguments will be inductive and issue in conclusions that fall short of certainty, but are nonetheless highly probable. Other arguments will be deductive and issue in conclusions that are certain (because the conclusion must be true if all the premises are true). For instance, design arguments tend to be inductive and probabilistic; cosmological arguments tend to be deductive. Christians have no problem with strong inductive arguments. When Paul appealed to the many eyewitnesses of the resurrection, he was effectively making an inductive argument (1 Corinthians 15:1-4; Acts 26:26). Not only was it a strong argument, it was the only argument that adequately explained the facts at hand. Kierkegaard was offering a false dichotomy: either Christians can build their faith entirely on deductive reasoning, and risk losing everything in the face of seemingly convincing counter-arguments, or they can ignore the arguments and make a leap to faith. In reality, deductive arguments for the existence of God have proven remarkably resilient, and inductive arguments have grown stronger as the amount of evidence accumulates in their favor (in areas like genetics, microbiology, archaeology, etc.). Even if the evidence for Christianity only ever rises to the level of “highly likely,” I can still have a reasonable, evidence-based faith. However, Kierkegaard was right in this one respect: we cannot build a scaffold to God out of facts and figures. As James reminds us: “even the demons believe–and shudder!” (2:19). Clearly, there is something more to Biblical faith than intellectual assent to the right number of propositions. Faith in its fullest sense is not a risky leap, but a confident walk (1 John 1:7). It is not a confidence in what we see now, but in what we know we will see later (Romans 8:24-25; 2 Corinthians 5:6-8; Hebrews 11:1). It is a confidence that is grounded, not on wishful thinking, but on the historical reality of the resurrected Savior. Atheists are welcome to attack the straw man of dictionary faith, but it has nothing to do with Biblical faith. Mark Twain, Following the Equator. Hartford, CT: American Publishing Co., 1897, p. 132. Sam Harris, The End of Faith. New York: W.W. Norton, 2004, p. 23. M. Jamie Ferreira, “Faith and the Kierkegaardian leap,” in The Cambridge Companion to Kierkegaard. Cambridge: Cambridge University Press, 1998, pp. 207-234. Soren Kierkegaard, Concluding Unscientific Postscript. New York: Cambridge University Press, 2009, 90fn56. George Pattison, “D.F. Strauss: Kierkegaard and radical demythologization,” in Jon Stewart, editor, Kierkegaard and His German Contemporaries: Theology. Aldershot, UK: Ashgate Publishing, 2007, pp. 233-257. William Lane Craig, Reasonable Faith, Third Edition. Wheaton, IL: Crossway Books, 2008, pp. 55-56.